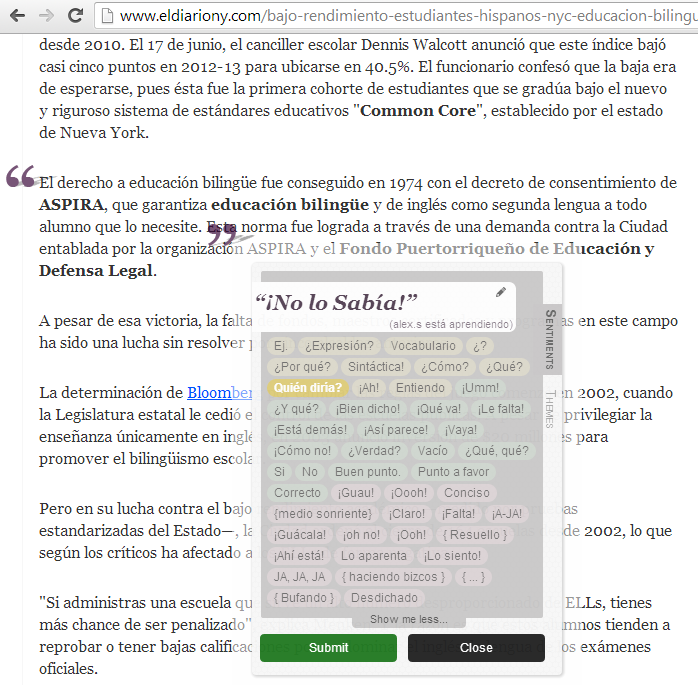 Ponder will work on texts (or videos) of any language and since 2013 when we launched our first set of Spanish sentiments, Ponder has been incorporating new language-specific scaffolds in cooperation with our teaching community. We now have sentiment sets in French, Spanish, Arabic, Irish-Gaelic (Gaeilge), and several others in progress. You can select an alternate sentiment set by clicking settings in the top right of the site, and then using the sentiment selector to switch to the appropriate language. The topic analysis of the articles students read works best in English, and will also work for French and Spanish language documents. However, nothing will prevent your or your students from creating reading responses on sites of other languages. If you are planning on using Ponder in a multi-lingual or primarily non-English language setting, we would love to hear about it! Please send us a note. Likewise, if you are interested in creating a set of sentiments in another language, read more about how sentiments can be customized - we'd be happy to collaborate with you to make that possible. There is community interest in creating sentiment sets for German, Danish, Portuguese and others. Contact us to get involved!